Playing it safe has never been Michael Franti‘s style, even when he veers unexpectedly into polished, shiny-happy pop. 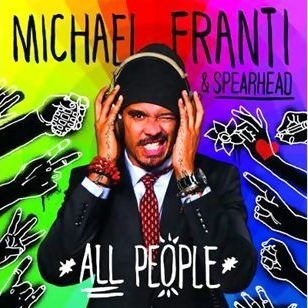 All People, the eighth studio album by the San Francisco-based singer/songwriter with his longtime backing band Spearhead, still offers glimpses of the protect-the-underdog agenda that has inspired Franti since his first musings with The Disposable Heroes of Hiphoprisy in the early ‘90s, but as a piece of pop song craft, this outing is a radical move on several levels. For the first time, Franti sought to collaborate with a different crop of songwriters and producers. It meant setting aside the dub-tech, ragga-reggae sound he’d cultivated with Jamaican production team Sly & Robbie—a decade-long partnership that stretches back to 2003’s Everyone Deserves Music, and yielded the certified dancehall hit “Say Hey (I Love You)” in 2009. With a production committee that features Australian producer Adrian Newman, American hitmaker Sam Hollander and Canadian pop powerhouse The Matrix, All People seems geared more for Christina Aguilera, Katy Perry or (name your pop star here). What keeps it grounded, for the most part, is Franti’s unflappable sincerity. “I’m Alive (Life Sounds Like),” with its whistled melody and relentless club beat, isn’t quite all bubblegum—“I can’t afford the rent or remember checks I sent/To pay off all my taxes and feed the president,” Franti sings— while “11:59” retains an apocalyptic menace (“It was 11:59 and 59 clicks/ Life support plugged in/The whole world sick”) beneath the mellifluous wash of The Matrix’s synthesized strings. Just when a song feels a bit too radio-friendly, Franti steps to the fore to keep things honest. The tactic doesn’t always work. “Closer To You” could have been a great love song if it weren’t draped in schlock, complete with a clap track from a Euro-disco nightmare. But then, in the sensuous, catchy groove of “Earth from Outer Space,” with an outstanding verse by K’naan, or the Trayvon Martin tribute “Say Goodbye,” the Franti we know emerges: the conscious, poignantly observant poet, telling it like it is.